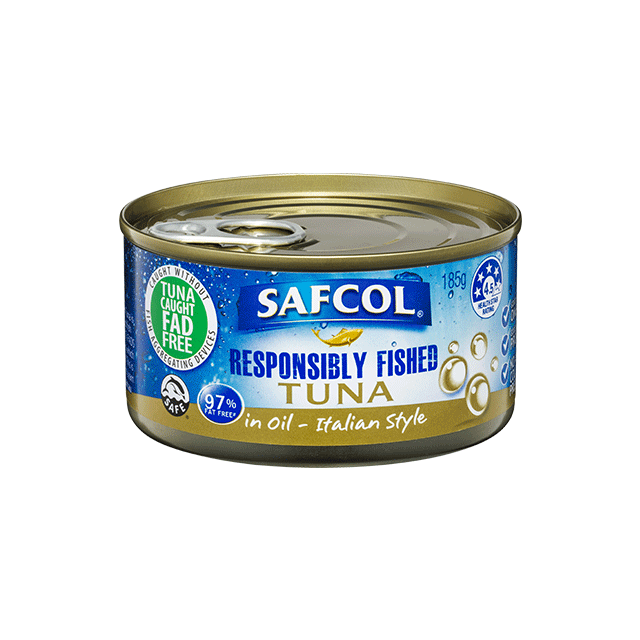 Safcol Responsibly Fished Tuna In Oil – Italian Style is 97% fat-free. Our well-loved range of flavoured tuna combines the natural goodness of tuna with delicious flavours. An instant taste sensation or perfect protein accompaniment to any salad, sandwich, stir-fry or pasta. With NO artificial colours and flavours, and NO MSG. To protect marine life, our Tuna is caught without the use of fish aggregating devices (FADS). FADS attract many sea creatures, which get caught with the tuna. This is detrimental to our oceans. Ingredients Fad Free Tuna (Katsuwonus pelamis) (70%), Oil Blend (15%) (Sunflower Oil, Extra Virgin Olive Oil), Water, Salt.